Dancing in your ski boots, soaking in the outdoor hot tub, indulging in hot chocolate & freshly baked treats, sipping cold beers on a sunny terrace – all highly recommended after a day on the mountain! Après-ski is a ski holiday must, but the range of unique activities and alternative ski experiences on offer is now bigger and better than ever, so whether you’re looking for an alternative to traditional après-ski or for a different way to spend your day on the slopes, check out our pick of the latest and greatest in unique ski experiences. Alta Badia is the place to be for anyone who loves eating and drinking as much as they love skiing! 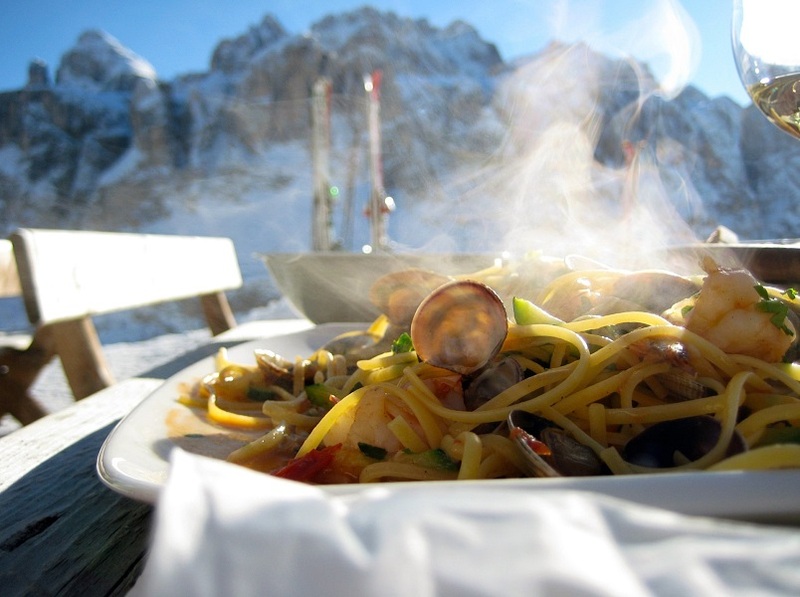 This is thanks to its Sciare con Gusto programme (roughly translated as “skiing with flavour”) which is a series of events throughout the season combining passion for winter sports with delicious cuisine. With the stunning scenery of the Dolomites and unrivalled local hospitality, this is simply not to be missed. Ski from one mountain hut to another, sampling a different dish designed by top Michelin-starred chefs in each one, as part of the Gourmet Ski Safari; this year’s theme was childhood favourites so traditional dishes executed to perfection were the order of the day. Book a place on a Sommelier on the Slopes event if you want to taste some of the best local wines in the company of a ski guide and local wine expert. Just remember you need to ski down the mountain at the end of the day! If you like to be first up on the slopes you can also enjoy breakfast on the slopes at the Las Vegas Lodge – take a snow cat up the mountain and sample the best local products from the Alto Adige region. To top it all off, you’ll be on the slopes before the lifts have even opened! >> We recommend: the fabulous 5-star Hotel Rosa Alpina in San Cassiano, just a 5 minute drive from the Alta Badia ski area.